Conflict theory and research has traditionally focused on conflict management strategies, in relation to individual and work team effectiveness and productivity. Far less attention has been devoted to 'soft' outcomes including job satisfaction, organizational commitment, turnover intentions, and individual health and wellbeing. This state of affairs is unfortunate because it isolates conflict theory and research from broader issues in organizational sciences and practice. The individual contributions to this volume each in their own way deal with one of these issues in more depth, shedding light on how conflict theory and research can be connected to organizational psychology in general. C.K.W. 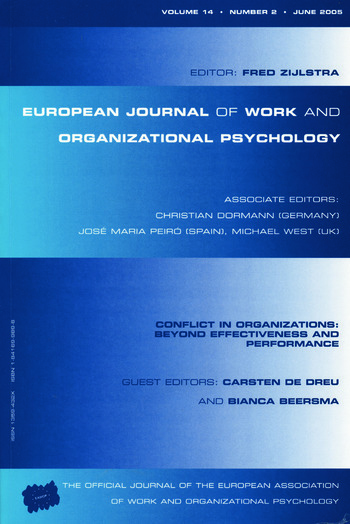 De Dreu, B. Beersma, Conflict in Organizations: Beyond Effectiveness and Performance. M.T.M. Dijkstra, D. van Dierendonck, A. Evers, Responding to Conflict at Work and Individual Well-being: The Mediating Role of Flight Behaviour and Feelings of Helplessness. E. Giebels, O. Janssen, Conflict Stress and Reduced Well-being at Work: The Buffering Effect of Third-party Help. J.M. Guerra, I. Martínez, L. Munduate, F.J. Medina, A Contingency Perspective on the Study of the Consequences of Conflict Types: The Role of Organizational Culture. A. Richter, J. Scully, M.A. West, Intergroup Conflict and intergroup Effectiveness in Organizations: Theory and Scale Development.